The best Black Friday 2018 PS4 deals in the USA are all here, as we scour the web for bargains on PlayStation 4 games, PS4 Pro consoles, PSVR headsets, and much more. We’ll be updating this page right throughout Black Friday 2018, so maybe consider bookmarking it as we add more lightning deals and discounts to the page over time. 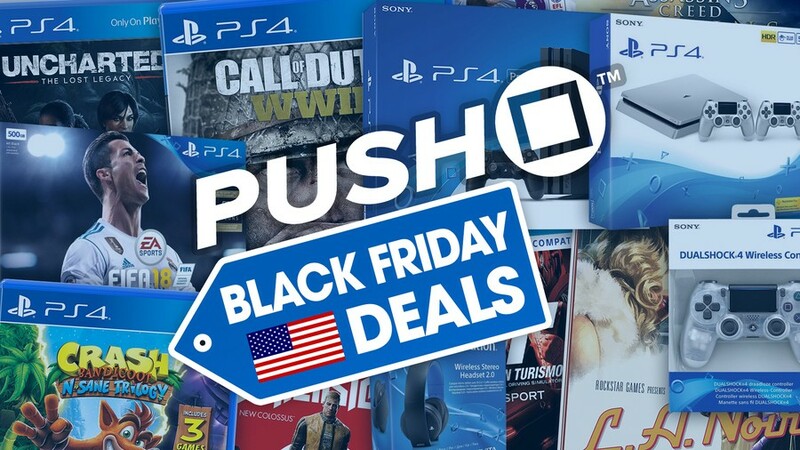 Also, don’t worry if you live outside of the United States and North America, as you can find the Best Black Friday 2018 PS4 Deals in the UK through the link. Remember, if you’re looking for something more specific, then you can find the Best Black Friday 2018 PS4 Bundles, Best Black Friday 2018 PS4 Games Deals, the Best Black Friday 2018 PSVR Deals, Best Black Friday 2018 PS4 Controller Deals, Best Black Friday 2018 PS Classic Deals, and the Best Black Friday 2018 PS Plus Deals through the links. What are the best PS4 Black Friday 2018 deals in the USA? We've searched the web for discounted PlayStation 4 games, cut-price PS4 Pro and PS4 Slim consoles, reduced PSVR headsets, and awesome PlayStation accessories. We'll be updating this list, so keep your browser locked as we add more lightning deals and hot discounts. Found a deal we don't have? Tell us about it so we can add it! When Is Black Friday 2018 in the USA? Black Friday is historically scheduled to take place the day after Thanksgiving, which happens to be Friday, 23rd November this year. However, as the event has grown, you should expect savings to begin as early as Friday, 16th November this year. What PS4 Deals Will There Be on Black Friday 2018? Sony’s already announced the bulk of its Black Friday 2018 offers, with a 1TB PS4 Spider-Man bundle dropping to $199.99 from 18th November. It’ll also be reducing the price of DualShock 4 controllers to $39.99, and applying huge savings to PSVR bundles. For more information on the latest savings, you can find the Best Black Friday 2018 PS4 Bundles, Best Black Friday 2018 PS4 Games Deals, the Best Black Friday 2018 PSVR Deals, Best Black Friday 2018 Controller Deals, Best Black Friday 2018 PS Classic Deals, and the Best Black Friday 2018 PS Plus Deals through the links. Did a big update on this, but there'll be much more tomorrow I imagine. Been saving all year for this sale, let's go! I'm considering getting Starlink, either the $35 physical from walmart of the $45 digital on psn. Wish the PSN black Friday had an additional PS Plus discount to help sweeten the deals more but still better than paying the full $60 for the game, which i think was overpriced. @get2sammyb keep up the good work! Today was my first time ever shopping on " Black Friday" although I did mine at 3:00 p.m. at my local GameStop. I managed to nab the last Spiderman PS4 bundle. I was a nervous wreck. Lol. There were only 6 bundles, and about fifteen people were in line in front of me, because they had their stock behind employee desks. I can't believe I actually got one. The funny thing is, I tried getting one on Tuesday, by trading in my OG PS4. I could have done it, but they sold out of the last one one hour before I arrived. Overall, I'm satisfied. I can't wait to experience Spiderman for the first time. It's almost downloaded as I type this out. MHW for only $15 is a steal. Mega Man 11 is $17 on Amazon. I bought a copy. Probably the only Black Friday shopping I'll do, haha. I just bought a new TV earlier in the week so I'm kinda nervous on spending much money for Black Friday. @playstation1995 Nice. The TV I bought is also a Samsung 4K TV. Exciting since it's my first TV that has 4K and whatnot. Also, have fun with your purchases! Word up. Was hoping for a Bomberman R sale. Maybe around Xmas.